Dive into the underwater world of marine animals! Written directly to the student, the gentle conversational style makes Zoology 2 perfect for elementary children to read on their own, or for family reading times with mom. Presenting information with a strong creationist viewpoint, this detailed book contains chapters on aquatic animals, whales, seals, fish, sharks, reptiles, Cephalopods and many other creatures you didn't even know existed! Narration may be easily used with younger children; notebooking and "ocean box" activities are included at the end of each chapter. Household labs develop the skills needed to conduct scientifically valid experiments in any field, while magnificent photos bring the ocean right into your classroom. 235 pages, indexed hardcover with answers to the narrative questions included. Expand your studies with notebooking activities, miniature books, review questions; Scripture copywork; field trip sheets; and much more! 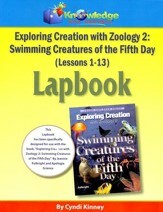 Accompanying Apologia's sold-separately Exploring Creation with Zoology 2: Swimming Creatures of the Fifth Day, students will take ownership of their learning as they fill it with notes and reminders of what they've learned through careful study. Apologia's Zoology 2 Junior Notebooking Journal provides grade-appropriate activities specifically geared towards younger students who aren't as advanced in their writing abilities. Almost the same length as the regular journal, the notebooking pages are designed to suit students struggling with their handwriting and writing skills; dashed writing lines, cut-and-paste, coloring pages, and fewer writing activities make the junior notebooking journal perfect for struggling older students or easily adaptable for younger K-3 grades. Coloring pages, scripture copywork, vocabulary flip-cards, puzzle pieces, "dive deeper" ideas, diagrams to label, word bank/fill-in-the-blank, and other fun lapbooking pages are included, as well as full-color minibooks. 232 non-reproducible pages plus 64-page full-color section. Spiral bound, softcover. 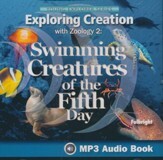 This audiobook CD is an audio recording of the sold-separately Apologia elementary textbook Exploring Creation with Zoology 2: Swimming Creatures of the Fifth Day, read by author Jeannie Fulbright. Perfect for students who are auditory learners, slow readers, or who have disabilities that make reading difficult! This is an MP3-CD; you must have an MP3-compatible CD player or computer to listen. Grades 1-6. Please Note: In order to improve the listening experience, some words and sentences have been altered from the textbook. 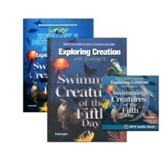 Dive into the underwater world of marine animals with Apologia's Exploring Creation with Zoology 2: Swimming Creatures of the Fifth Day textbook Written directly to the student, the gentle conversational style makes Zoology 2 perfect for elementary children to read on their own, or for family reading times with mom. Presenting information with a strong creationist viewpoint, this detailed book contains chapters on aquatic animals, whales, seals, fish, sharks, reptiles, Cephalopods and many other creatures you didn't even know existed! Narration may be easily used with younger children; notebooking and "ocean box" activities are included at the end of each chapter. Household labs develop the skills needed to conduct scientifically valid experiments in any field, while magnificent photos bring the ocean right into your classroom. 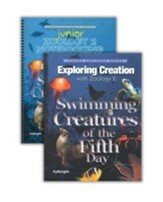 The Apologia Zoology 2 Notebooking Journal will help you expand your students' studies with notebooking activities, miniature books, review questions; Scripture copywork; field trip sheets; and much more! Students will take ownership of their learning as they fill it with notes and reminders of what they've learned through careful study. Includes "What do you Remember" review/dictation questions, notebooking assignments, Scripture copywork, vocabulary crosswords, project pages, miniature books, a final review,and more. 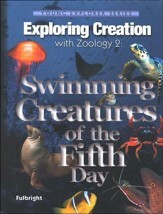 Exploring Creation with Zoology 2: Swimming Creatures of the Fifth Day Textbook; 235 pages, indexed hardcover. Zoology 2 Notebooking Journal, softcover, spiralbound. The Apologia Zoology 2 Junior Notebooking Journal provides grade-appropriate activities specifically geared towards younger students who aren't as advanced in their writing abilities. Almost the same length as the regular journal, the notebooking pages are designed to suit students struggling with their handwriting and writing skills; dashed writing lines, cut-and-paste, coloring pages, and fewer writing activities make the junior notebooking journal perfect for struggling older students or easily adaptable for younger K-3 grades.Coloring pages, scripture copywork, vocabulary flip-cards, puzzle pieces, "dive deeper" ideas, diagrams to label, word bank/fill-in-the-blank, and other fun lapbooking pages are included, as well as full-color minibooks. 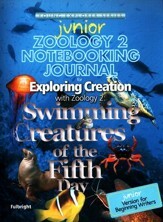 Zoology 2 Junior Notebooking Journal, 232 non-reproducible pages plus 64-page full-color section. Spiral bound, softcover. The MP3 Audio CD is an audiobook recording of the textbook, read by author Jeannie Fulbright (though in order to improve the listening experience, some words and sentences have been altered from the textbook). Perfect for students who are auditory learners, slow readers, or who have disabilities that make reading difficult! This is an MP3-CD; you must have an MP3-compatible CD player or computer to listen. The Apologia Zoology 2 Notebooking Journal will help you expand your students' studies with notebooking activities, miniature books, review questions; Scripture copywork; field trip sheets; and much more! Students will take ownership of their learning as they fill it with notes and reminders of what they've learned through careful study. Includes "What do you Remember" review/dictation questions, notebooking assignments, Scripture copywork, vocabulary crosswords, project pages, miniature books, a final review, and more. The Zoology 2 Lab Kit has almost everything you need to complete the book's hands-on experiments and activities - all right at your fingertips. Supplies included enable children to complete an electric circuit (demonstrates how salt water conducts electricity), demonstrate how blubber keeps whales warm in cold ocean temperatures, and make their own "fossils," just to name a few! Items are packaged in individual lesson bags for ease of use. Some household/fresh materials will still need to be gathered by parents. Zoology 2 Lab Kit from Nature's Workshop Plus! The Apologia Zoology 2 Junior Notebooking Journal provides grade-appropriate activities specifically geared towards younger students who aren't as advanced in their writing abilities. Almost the same length as the regular journal, the notebooking pages are designed to suit students struggling with their handwriting and writing skills; dashed writing lines, cut-and-paste, coloring pages, and fewer writing activities make the junior notebooking journal perfect for struggling older students or easily adaptable for younger K-3 grades.Coloring pages, scripture copywork, vocabulary flip-cards, puzzle pieces, "dive deeper" ideas, diagrams to label, word ban k/fill-in-the-blank, and other fun lapbooking pages are included, as well as full-color minibooks. 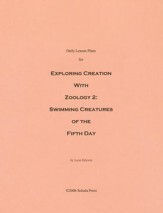 This schedule of daily lesson plans is designed to be used alongside Apologia's sold-separately Exploring Creation with Zoology 2: Swimming Creatures of the Fifth Day. Arranged by lesson, each day's work is laid out for the student with page numbers, notebook activities, project activities, experiments, and supplies needed. Printed-paper; stapled in corner. 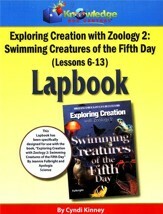 This lapbook CD-ROM accompanies the sold-separately Exploring Creation with Zoology 2: Swimming Creatures of the Fifth Day. Easily create your own lapbook with this printable, do-it-yourself format! The Lapbook Assembly Guide provides instructions and diagrams on assembling the lapbook, and where to glue each booklet. The Student Instruction Guide is written directly to the student and provides information on what should be written inside each booklet and what folder it should be glued to. The Teacher's Guide section features page numbers for where answers may be found in the textbook and suggestions for extra activities. Booklet templates are also included. Easily create your own lapbook with this pre-printed, do-it-yourself format! 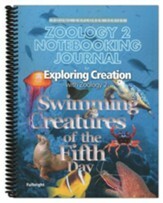 This notebook covers all lessons 1-13 of the sold-separately Apologia Exploring Creation with Zoology 2: Swimming Creatures of the Fifth Day. The Lapbook Assembly Guide provides instructions and diagrams on assembling the lapbook, and where to glue each booklet. The Student Instruction Guide is written directly to the student and provides information on what should be written inside each booklet and what folder it should be glued to. The Teacher's Guide section features page numbers for where answers may be found in the textbook and suggestions of extra activities. The included booklet templates includes all of the booklet templates; they have been printed on colors thought to improve retention of information presented. Softcover. Easily create your own lapbook with this pre-printed, do-it-yourself format! 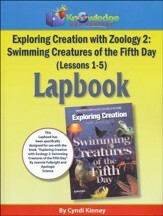 This notebook covers ONLY lessons 1-5 (out of 13 in the text) of Apologia's sold-separately Exploring Creation with Zoology 2. The Lapbook Assembly Guide provides instructions and diagrams on assembling the lapbook, and where to glue each booklet. The Student Instruction Guide is written directly to the student and provides information on what should be written inside each booklet and what folder it should be glued to. The Teacher's Guide section features page numbers for where answers may be found in the textbook and suggestions of extra activities. The included booklet templates include all of the booklet templates; they have been printed on colors thought to improve retention of information presented. Softcover. Easily create your own lapbook with this pre-printed, do-it-yourself format! 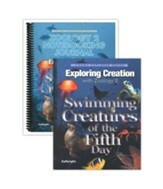 This notebook covers ONLY lessons 6-13 of the sold-separately Apologia Elementary Exploring Creation with Zoology 2: Swimming Creatures of the Fifth Day. The Lapbook Assembly Guide provides instructions and diagrams on assembling the lapbook, and where to glue each booklet. The Student Instruction Guide is written directly to the student and provides information on what should be written inside each booklet and what folder it should be glued to. The Teacher's Guide section features page numbers for where answers may be found in the textbook and suggestions of extra activities. The included booklet template section comprises the majority of the pages, and includes all of the booklet templates needed to construct the lapbook; they have been printed on colors thought to improve retention of information presented. Softcover.